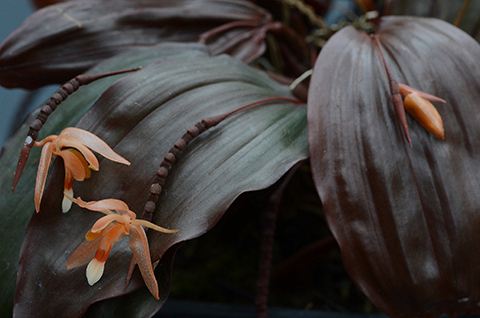 The most remarkable orchids aren't always the largest. Coelogyne monilirachis is a great example. 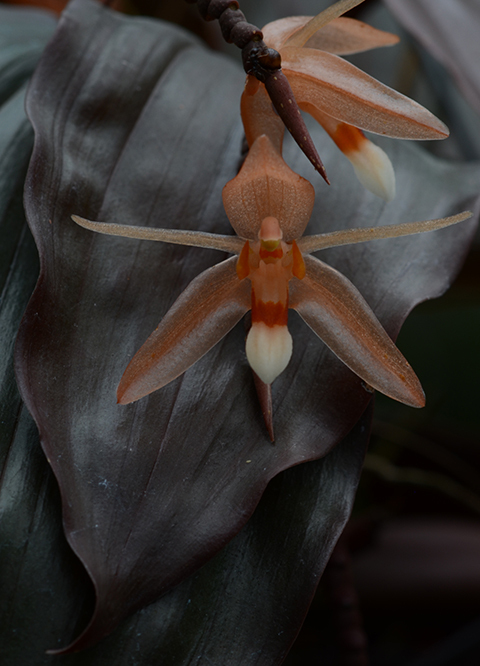 Coelogyne monilirachis is a tropical orchid with gorgeous dark bronze leaves and translucent orange flowers. Even the flower spike is extraordinary. The flowers are borne successively at the end of what looks like a strand of beads. Monilis means necklace-like. In the wild Coelogyne monilirachis grows as an epiphyte in lower montane forests at 1100 to 2700 m in the Malaysian states of Sabah and Sarawak on the island of Borneo. In the Fuqua Orchid Center our plant has flowered continuously for a couple of years. I have never seen another one in cultivation. Stop by and discover this wonderful orchid!